If liberals really thought West was irrelevant, said Michael Goodwin in NYPost.com, they wouldn’t be going “absolutely bonkers” over his support for Trump. The Left called the Oval Office meeting a “minstrel show” and “white supremacy by ventriloquism,” and condemned West as an Uncle Tom. “Whoa, Nellie. 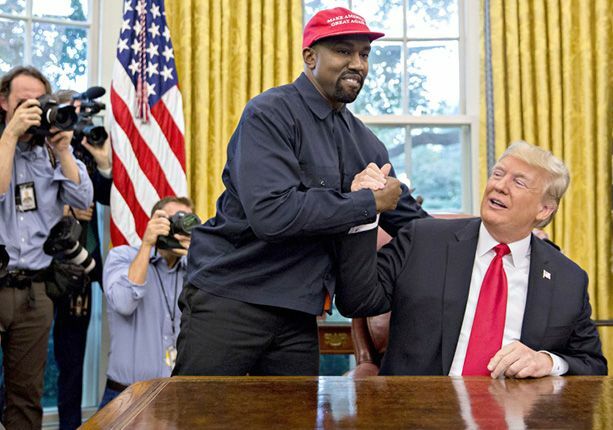 What nerve did he touch?” All it took to generate this “outpouring of wrath” was a black celebrity questioning African-American voters’ blind loyalty to Democrats. Under Trump and his booming economy, about 800,000 more African-Americans have jobs now than they did when Trump took office. “With West in tow,” said Ed Rogers in WashingtonPost.com, “Trump could walk into the most impoverished neighborhoods” and ask young people, “Who do you think wants you to have a shot at getting rich, me or Bernie Sanders? Me or Elizabeth Warren?” It’s a no-brainer.